You want to host your summit, but the number of tasks seems never-ending and you just don't know where to begin. Not anymore! 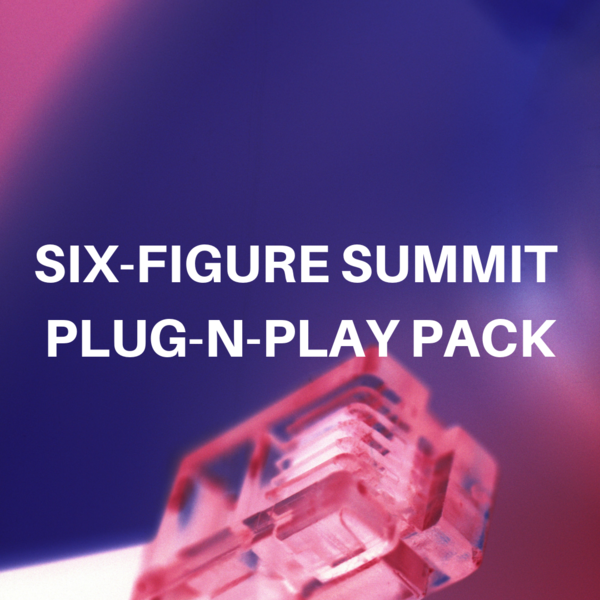 Use this plug-n-play pack and cut your to-do list in half! Trello Workflow - This roadmap will tell you what you need to do every day for the next 3 months to flawlessly plan, execute, and launch your six-figure summit. (6) Summit Lead Pages - These pages work best in the LeadPages Software and can also be used with WordPress. Lead Page (signup page)- Use this page to get attendees to sign up. Upgrade Page (order form) - Use this page to upsell the All-Access pass. Thank You Page - Use this page to say thank you and invite attendees to join your group. Too Early or Too Late Page - Use this page to block the daily interview pages. Speaker Appointment Page - Use this page so speakers can schedule their appointments with you. Summit All Access pass Video Script - Use this script to create your upsell video and gain more sales immediately. Summit Affiliate Swipe File (Ambassadors) - Plug in your info and send this to your ambassadors. Let them help you fill your summit. Summit Speaker Swipe File - Plug in your info and give this file to your speakers so they can promote your summit with their audiences. Summit Offer map - If you want your summit to sell, you need an irresistible offer. Use my summit offer map and edit it to fit your summit. Summit Guest Email Sequence - No need to write your emails. Use these emails to plug into your email software and schedule. Sample Summit Speaker Promo Graphics - Use my graphics to create your own.